Is a Guru necessary for Moksha? a Guru/Satsanga necessary for Moksha? Is it not sufficient if we have access to the teachings through mp3s?”. Naturally Vedanta saadhakas can find this easier to understand. All glory to the teachers! 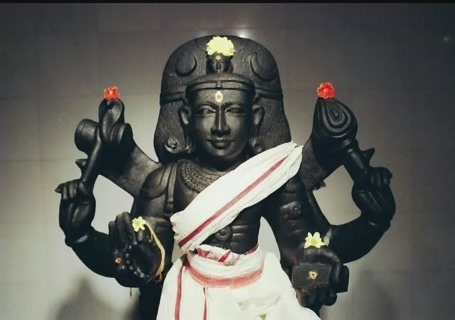 I see the whole exercise of Shravana-manana-nididhyaasana along with the acquiring and fine-tuning of all the saadhana-chatushtaya sampatti as a huge endeavour by the individual to convert the outwardly-looking mind (meaning a mind which keeps on reporting duality, “I am separate from the rest of them and therefore I have to fight tooth and nail to survive and accomplish my ends”) into an inward-looking mind (meaning a mind which no longer reports duality, and therefore is without any worry about the survival of the body or even itself).Moksha is basically characterised only by the removal of avidya (about one’s infinite nature). There is clearly nothing more to it than that. It should be clear that nothing new is gained and therefore it is merely a process of recognition of one’s ever-existing freedom. And therefore Atma-“jnaanam” is said as the means to Moksha.The Vedanta Prakriya to teach about the Atma, as you may know, is one of adhyaaropa-apavaada. It first goes along with the seeker in his own level, raises some questions there, corners the seeker, and ultimately provides some samaadhaanam at a slightly higher level. Upto this point is adhyaaropa. Then further it questions the adhyaaropa level and raises some issues with it, and then suggests another higher and finer level by sublating (apavaada) the lower level which was existing.This is not only true with regards to the theory of teaching, but its true in the manner the teaching is lived. For example, to a person who lives purely based on his raaga-dvesha, Vedanta would first point out the defects in such a life and encourage a life of dharmic pursuit of kaama and artha. Then further would be karmayoga, and then jnaana yoga. Each one of these will have multiple sub-levels of adhyaaropa-apavaada. 2. Furthermore, atma-gyaana is basically a process of ego-destroying (by understanding) and not accumulation of objective knowledge. How does one know that the ego is destroyed (so to speak)? It is only by the absence of need towards kaamini and kaanchana. “Clean langoti and empty pocket”, as our teachers often used to say. Individuality is strongly imbibed in these two needs, so whenever they crop up one should know that individuality is still strong. One may know the teaching in and out in the intellectual sense, but unless the need for kaamini and kaanchana is given up, there is no end to sorrow (individuality) and moksha remains far away. Hence to break this, a powerful presence which does not give in to kaamini or kaanchana is needed around us. For this also a Guru is important. 3. Then there is also the practical necessity of a physical person as a teacher. It is well known that sitting in classes in person is far better (in general) than seeing videos or listening to audio. This is true with respect to worldly or spiritual knowledge. It is much more easier to concentrate and grasp what the teacher is saying when it is in person. The points of stress come across much better. So for these reasons also a Guru is important. 4. Yet another reason is once again concerned with the nature of knowledge as ego-destroying. This directly implies complete humility and surrender. It is my personal conviction that without falling at the feet of a live Guru, the ego will constantly remain strong. The mind will give innumerable number of excuses on why the ego has to remain alive and strong. On the other hand, when a seeker does complete surrender to one person who is the epitome of spiritual life and Atmagyaana, then his mind will find shaanti in being under his shadow. There is nothing like this shaanti. This surrender is far more powerful than surrender to the Lord (whom we cannot see as a live person in general), because surrender to the Guru means that the reigns of one’s life (body-mind) is given to the Guru. Ishwara cannot come to us and say, “You have to do this”. But a Guru can say so. And his directions are to be obeyed implicitly, because only that is true surrender. Thus, such a surrender is key to the weakening of the ego and its final sublation/destruction through self-knowledge. 5. Another reason is that there is truly nobody except the Guru who is really our well-wisher. The Guru alone has no axe to grind in this world. He has no reason to either teach or guide the seeker, but he still does without any expectation. It is only wise that the seeker finds and submits to such a Guru. 6. Another important reason is that the manana process of Vedanta vichaara which comes after shravana necessitates the presence of a live Guru. Every person has doubts about the Vedanta tattva, and no two have the same set of doubts. To eliminate these doubts a physical person is very much essential. The manana process is not a one-way street like listening from mp3s.